20160410 + Up nice and late and nice and warm. 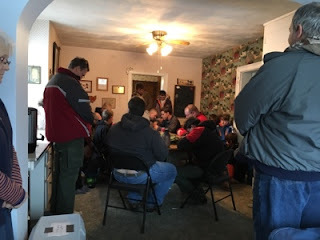 We all got suited up and headed out to meet the scouts that spent the night outside again last night and the temp got down to 16 degrees :-o We all gathered in the Farmhouse and the Scouts held their closing meeting that included roses and thorns of the campout and a prayer. As the scouts filed out they each got a little bottle of maple syrup. The Scouts did their final cleanup and hit the road. GpaWD&I did some outside cleanup while GmaWLJ&G got the Farmhouse cleaned up. After things got good a cleaned up we headed up for a nice lunch. As we packed the car the little boys turned in to demons (very tired little boys). We got on the road and all 3 boys were dead asleep in 15 min. Home, got things unloaded, cleaned up and settled in for homework. D&I ran to Giant Eagle and got some food. Home and found tiny 'X' pastas for L's class next week. We had some dinner and then D&I headed to a 'Home Church' parent night. I listened and and then asked questions about this Xenos based home church my son is attending. So far so good. I will have to do much more investigating before a conclusion is draws... I left D there and got home to chat with Lna bit about the meeting then Chris stopped over to watch 'Fear the Walking Dead'. Stayed up a bit longer with D to ship some Ebay sales.